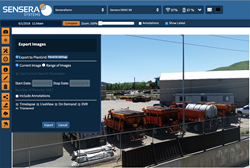 Sensera's integration with construction productivity software platform PlanGrid allows users to select, manage and organize Sensera images directly through PlanGrid. Sensera Systems, the fastest-growing manufacturer of solar-powered construction monitoring and site security products, today announced it has teamed with PlanGrid, the leader in construction productivity software, to integrate job site camera and mobile imagery into their construction productivity software. Sensera will be demonstrating the integration at the PlanGrid Construction Summit in San Francisco, CA on June 10-11, 2018. “Sensera's photo interface now integrates seamlessly with PlanGrid's project management software, allowing PlanGrid users to document important construction projects and track progress with high resolution images and content,” said David Gaw, CEO of Sensera Systems. “As adoption of new job site technologies, rapidly increases, we are committed to making SiteCloud communicate seamlessly with other platforms to streamline workflows and maximize technology investments. We are excited to add PlanGrid’s construction productivity solutions to our list of integration partners." The strategic partnership provides PlanGrid users with the ability to view, store and share jobsite photos with contacts or within their PlanGrid projects. PlanGrid users can also link photos imported from SiteCloud directly to their project documents. The integration announced today allows Sensera SiteCloud users to automatically transfer their camera imagery in real-time to PlanGrid, enabling project teams to immediately share information across the entire team. The integration supports all the latest features of SiteCloud including SitePOV imaging, which allows users to capture geotagged images around the jobsite using their smartphone, and combine photos taken with handheld devices with their fixed camera images for a comprehensive view of progress. This smart visual content leads to improvements in project management costs and schedules by helping identify issues early. To learn more about Sensera’s new partnership with PlanGrid and to start improving your jobsite productivity today, visit http://www.senserasystems.com/plangrid. Sensera Systems designs and manufactures solar-powered cameras, mobile apps and cloud-based software for affordable, automated monitoring for construction and job site security. Sensera’s patented 4G LTE and WiFi-enabled cameras with SiteCloud service help construction professionals remotely monitor, document, secure and market projects of all sizes, in any location. Sensera's SiteCloud software and SitePOV mobile app integrate with leading construction software systems to simplify project workflow, photo management and documentation archival. Sensera’s all-in-one, affordable camera systems have been adopted by general contractors nationwide, making Sensera the fastest growing solar site camera manufacturer.